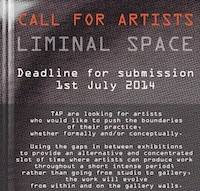 TAP are inviting artists to apply to use the gallery space between 28 July – 3 August. TAP are looking for artists who would like to push the boundaries of their practice, whether formally and/or conceptually. Using the gaps between exhibitions to provide an alternative and concentrated slot of time where artists can produce work throughout a short intense period; rather than going from studio to galery, the work will evolve from within and on the gallery walls.